Police executed a search warrant on a Montville property, where an alleged drug lab was found. A MONTVILLE woman says the man at the centre of the final days of a historic Sunshine Coast drug operation is one of the kindest men she has ever met. 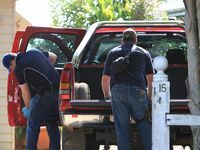 The 57-year-old former Italian teacher said the large-scale raid on her neighbour’s property yesterday confirmed the town’s long-held suspicions. But her neighbour of two years was “one of the best people I know”. “It’s very sad. He’s a very nice guy, very helpful and very good-hearted. He let me use his phone once when I was sick,” said the native Brazilian woman, who did not want to be identified. The Balmoral Avenue father at the centre of yesterday’s Montville bust was arrested after police allegedly found two methylamphetamine “speed” laboratories in two sheds on his property. He is one of 39 people arrested on a total of 117 offences in the year-long taskforce Operation Ice Vulture. 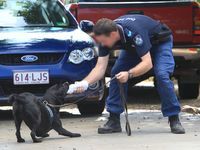 Star of television series Send In The Dogs, Jazz, a drug squad dog of four years, was with police at the property yesterday. The operation netted $1.8 million worth of drugs, including ecstasy, methylamphetamine, cannabis and rave party drug “fantasy” or GHB. Sunshine Coast police chiefs say the large-scale manufacture was planned for Sunshine Coast streets. A 25-year-old Conondale man was charged with trafficking on Monday and became one of the most serious arrests in the operation. 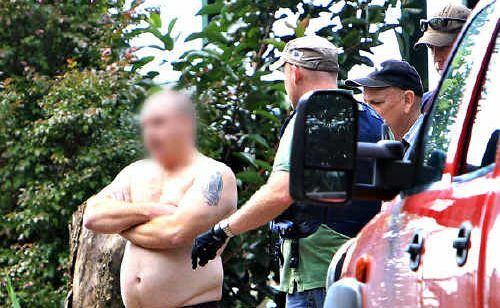 Queensland’s elite drug investigation team praised the efforts of the Coast’s detectives in unravelling what is one of the biggest and most successful operations in the region’s history. The state’s drug enforcement team came on board last September. North Coast police regional crime coordinator Maurice Carless said drug manufacture in the region was an ongoing struggle. Superintendent Carless said the wide spread effects of the industry had caused countless loss of lives on Sunshine Coast roads. “It’s difficult to predict how much of that may have been attributed to drugs, but whether it’s marijuana ecstasy or any of the others, these do have an effect and those deaths could have been prevented in some circumstances,” he said. 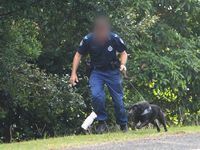 Superintendent Carless praised Sunshine Coast detectives, but added the pursuit of drug offenders was far from over.